Immigrant Justice Bond Fund What is the Fund and how to access How To Give and Get Involved Context - Why an Immigrant Bond Fund? Context - Why an Immigrant Bond Fund? Episcopal City Mission is a faith-based ministry which promotes social and economic justice working through partnerships with congregations, community-based organizations and people within the Diocese of Massachusetts with special emphasis on the urban poor and oppressed. As a result of unjust immigration policies there is currently a high need for people to accompany, represent, and offer pastoral care to people in our immigration system. Come and learn how you can get involved in the work of accompaniment and immigrant justice on Thursday, August 30th. Opportunities are available for anyone interested - especially lawyers, clergy, and anyone interested in volunteering! Join us for wine, hors d’oeuvres, and an informational session about how to get involved in this pivot work in partnership with Episcopal City Mission. The Reverend Amy Whitcomb Slemmer, Esq. We are in the home stretch of our attempts to secure protections for immigrant families in Massachusetts - the formal legislative session ends July 31. We need all hands on deck to ask our legislators to ACT NOW and pass protective legislation before Tuesday. Earlier this week, Bishop Alan Gates, Bishop Bud Cederholm, and Dean Amy McCreath joined faith-rooted and grassroots leaders to lament that legislators have still not acted in favor of immigrant families - watch a video of Bishop Gates speaking at the rally here. Call and email your legislators and ask for the immediate passing of statewide immigrant protections before July 31. Call and email both your Representative and Senator (find names and contact information here). Make sure to identify yourself as a constituent - see details below for how to make a strong ask. Call Speaker DeLeo's office at 617-722-2500 and ask him to bring the legislation to the floor. 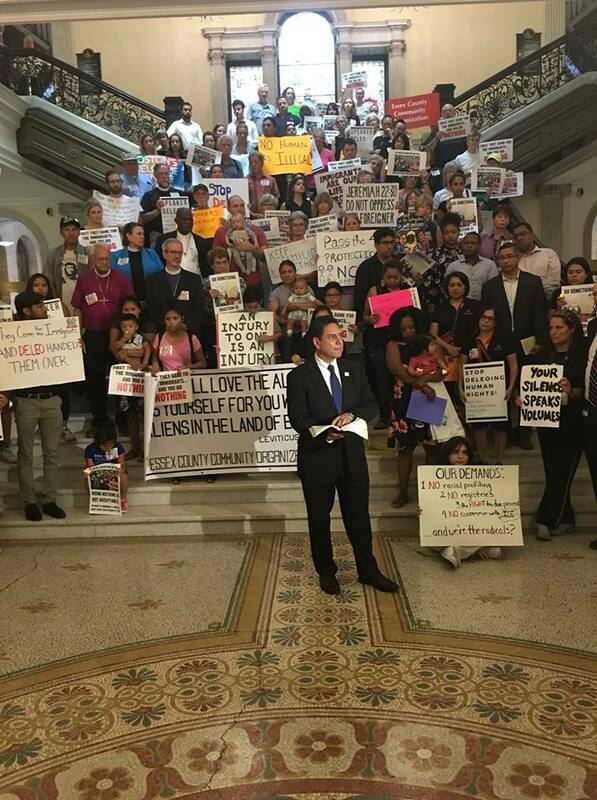 The message: Immigrant families in Massachusetts are suffering. Hyper-aggressive enforcement is tearing families apart every day, and thousands more live in fear that a traffic stop or 911 call could destroy their world. This is a crisis, and we can't wait another year to address it. Please find a way to pass the four protections that the Senate had included in the budget. As your constituent, I expect you to fight for what's right. Urge leadership to bring these protections to a vote, one way or another, before July 31. Thank you! You can also use our partner MIRA's Phone2Action page, which allows you to call or email your legislators with one click. For more information and support, contact ECM's Lead Organizer, Dax Crocker, at 617-590-8606 or dax@episcopalcitymission.org. 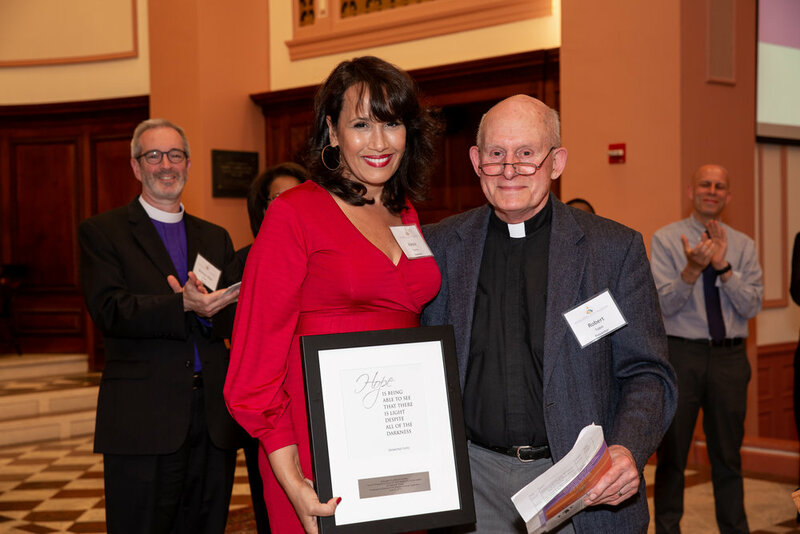 ECM celebrates our 2018 Awardees - courageous faith and spirituality-rooted leaders working for immigrant justice. To learn more about Alexie Torres, the Reverend Dorothella Littlepage, and St. Paul's Newton Highlands, click here! Thank you for attending Episcopal City Mission's 2018 Annual Celebration, Prophetic Hope: The Soul of the City, and for making the evening such an inspired night. It was the launch of the renewed focus of our strategic plan and we are delighted that you could be part of this important milestone. You can see photos from the event on ECM's Facebook page - even if you do not personally have a Facebook page! While the evening was very special, we welcome your feedback and reflections about opportunities to enhance the event even further. Please take 5 minutes to give feedback on the event through this short survey. Today, we witness moral crises at the highest echelons of our political leadership as our President equates asylum seekers and refugees with pests and shamelessly supports the elimination of the most basic constitutional due process protections that residents enjoy. These developments have happened against the backdrop of children of all ages being separated from parents and detained in cages in warehouses. Families have arrived at our borders fleeing violent persecution, death threats and grinding poverty. Why else would anyone consider coming to this country with their children at this time? These unjust practices deny the humanity and dignity of those who have risked their lives for safety. In this difficult and challenging moment, ECM calls on each of us to embrace prophetic hope through action. Join a Families Belong Together rally this weekend, join a prayerful and educational evening on the North Shore; find solace at a local house of worship this weekend or join ECM's advocacy work as we vigorously advocate for just and equitable pathways to citizenship; or make a donation to our campaign. ECM's vision is that every detainee in Massachusetts must have effective counsel and be known and accompanied through the difficult process of establishing permanent residency. Statistics show 68% of people detained by ICE are ultimately allowed to remain in the US when they have access to legal counsel and can mount their case from outside prison walls. Our ambitious and immediate funding goal is to raise $500,000 to increase the number of lawyers available for this challenging work and to engage parishes and communities of faith to walk with their brothers and sisters as unabashed allies in this difficult time. Click here to contribute today. Please stay in touch and let us know about how you manifest hope through action. See this action alert from ECM about more ways you can taking action and keep families together today. We take comfort in remembering the prophetic words of Cornel West who implored us to "Never forget that justice is what love looks like in public." May we each find opportunities to publicly demonstrate love in the coming days as we take steps toward justice. We are so grateful to be joining you to demonstrate love doing justice. On Wednesday, March 14, in collaboration with interfaith partners and grassroots organizers in the Pioneer Valley, Episcopal Church youth and bishops will stand peacefully for one hour, 3-4 p.m., outside the gates of Smith and Wesson (2100 Roosevelt Avenue) in Springfield. Speakers will include Episcopal youth, along with the bishops of both Massachusetts Episcopal dioceses and other interfaith leaders and local partners. Smith and Wesson is the point of production for the gun used to kill 17 people in Parkland, Fla., on Feb. 14 and in two other mass shootings--in Aurora, Colo., and San Bernadino, Calif. Inspired by the direct and compelling action of the students of Marjory Stoneman Douglas High School, the March 14 action at Smith and Wesson is being led by youth and supported by adults in the community of faith. Clergy and adult leaders are invited to accompany youth to this action. It is taking place on the one-month anniversary of the Marjory Stoneman Douglas shootings and on the day that many youth will participate in a national school walk-out for 17 minutes--one minute for each life lost at Marjory Stoneman Douglas. Clergy participants are asked to wear clerical attire and purple stoles; all are invited to wear purple if they choose. Questions about the March 14 action in Springfield may be directed to St. Stephen's Church, Boston organizer Sarah O'Connor at sarah@ssypboston.org. In a statement from its March 6-9 meeting in Texas, the Episcopal Church's House of Bishops called on Episcopalians to make March 14 a day of lamentation for those lost to gun violence. The statement encourages Episcopalians to move from prayer to action. Many youth, congregations and clergy plan to participate in the March For Our Lives in Washington, D.C., Boston, Northampton, Worcester and Springfield on Saturday, March 24. In Boston, the Cathedral Church of St. Paul (138 Tremont Street) will provide hospitality and youth organizing activities to march-goers on March 24, opening at 10 a.m.
WHY: Mass shootings in schools and other public places are just one way that gun violence has a negative impact on the lives of young people (and adults). We are grateful to the courageous and direct leadership of the students of Marjory Stoneman Douglas High School in Parkland, FL for putting the issue of gun violence front and center of our attention and conversations. We agree, enough is enough. We add our concerns about daily violence in cities and the traumatic stress that comes from growing up in neighborhoods with too frequent, dare-we-say-sinful levels of gun violence. We are grieving, fearful, and angry. Therefore, ECM joins a movement of community leaders who will be peacefully Standing Up for Our Lives outside Smith & Wesson in Springfield, MA. This is the point of production for the guns used in the mass shooting in Parkland, FL (and Aurora, CO and San Bernadino, CA) and for the guns used most frequently in crimes in cities like Chicago. Smith & Wesson is selling an unsafe product and in the name of consumer safety and protection, we are asking them to stop. Young people from Boston, Springfield, Holyoke, Worcester and Brookline, together with clergy from across the state, will be bringing those 3 demands directly to the Smith and Wesson headquarters next Wednesday, and they invite you to join us there at 3:15pm. There will be a bus leaving from Boston's South End at 11:30am and returning by 6pm. To sign up for a spot on the bus, to hold a role at the action, or to support this action in other ways, Please fill out this form, and feel free to reach out to me at sarah@ssypboston.org with any questions or to get involved. We are reaching out to additional organizations, faith groups, politicians and leaders. 3) Put a moratorium on selling any new assault weapons until issues of consumer safety are resolved. WHAT TO WEAR: Bishops will be wearing cassocks.Clergy are asked to wear their appropriate clerical attire. Christian clergy and others are asked to wear purple stoles. All are asked to wear purple if you feel so moved. ...it struck me that it is the very blessedness of our immigrant neighbors - who are hungering and thirsting for righteousness, who are in mourning - that the federal government is determined to deny. Help the Safe Communities Coalition mobilize for a statewide Call-In Day for Safe Communities on January 31st! The Safe Communities Act protects the civil rights, safety and wellbeing of all residents by drawing a clear line between immigration enforcement and public safety. Sponsored by Sen. Jamie Eldridge (S.1305) and State Rep. Juana Matías (H.3269), it ensures that our tax dollars are not used to help the Trump administration deport immigrant families or create a Muslim registry. Learn more here. Help the Safe Communities Coalition mobilize for a statewide Call-In Day for Safe Communities on January 31! We'll be calling our legislators to tell them we want the Safe Communities Act to be referred out of committee by the February 7 referral out deadline. We need to bring the phone lines down on January 31. Here's how to get involved: join our Phone to Action network and receive Action Alerts via text. Once you sign up, your response the to the text will send an automatic email or generate a call to your own state legislators. 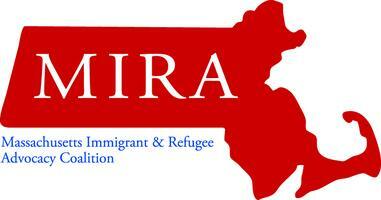 Get informed and receive action alerts by signing up for the MIRA bulletin here. Sign up for MIRA's weekly email bulletin here. The Greater Boston Cluster is a group of congregations and organizations working together to support immigrants and their families. We partner with community organizations to support their members’ needs for accompaniment. Accompaniment can include going with someone to court, or attending a vigil. It also includes support such as making advocacy calls, writing a letter, providing a ride or supporting a family whose loved one is in detention. At the invitation of Jobs with Justice, a small group of clergy are organizing other clergy to visits folks in immigration detention at South Bay House of Corrections for pastoral visits and to assess what family and legal support might be of use. If you have daytime weekday availability and energy for this emergent, messy, compassionate work, please follow up with Elizabeth Nguyen at enguyen@uua.org! On Monday, November 20, 2017, the U.S. Department of Homeland Security announced that in July of 2019 it will end Temporary Protected Status (TPS) for immigrants from Haiti. TPS is an immigration status providing employment authorization and deportation protection for people who cannot safely return to their home countries due to environmental and social crises. The decision has significant implications for Massachusetts, which is home to more than 4,700 Haitians with TPS who have lived in the U.S. for an average of 15 years. In the past three months, the Trump administration has terminated TPS for three countries – Sudan, Nicaragua and Haiti. These decisions to end TPS are not based on changed circumstances in the home countries; in Haiti, for example, public health, food and housing insecurities, and fragile governmental supports continue to present serious risks and dangers. These decisions, alongside other changed immigration policies and vitriolic rhetoric, make clear the administration’s desire to push immigrants out of this country. Moreover, our government keeps on edge those immigrants from El Salvador and Honduras protected by TPS as a decision regarding the extension of their TPS is still forthcoming. The sacred scriptures of Christianity remind us that the Earth belongs to God, and that justice is not to be withheld from the widows, immigrants, orphans, or poor people. As Christians, we follow Jesus’ example and commit to loving our neighbor by building bridges not walls, broadening our boundaries rather than closing them, and witnessing God in the lives of our disinherited neighbors and friends. Therefore, we urge all people of faith to hear the voices of immigrant people calling for justice, and to boldly oppose the decision to end TPS. As a result of these decisions, nearly 12,000 Salvadorans, Hondurans, and Haitians living in Massachusetts face a more dangerous and more uncertain future. For our immigrant neighbors, these actions will lead to the loss of homes and the separation of parents from children. It is time for people of faith to join immigrant leaders like MIRA and Centro Presente who have spent years fighting for permanent protection for immigrants. We are urging our public leaders to create a fair pathway to permanent protection. Join us in publicly decrying this decision by adding your name to this letter and sharing this letter through social media. Offer a visible presence for justice by attending a rally to Save TPS on January 10th at the Massachusetts State Houses led by Centro Presente. accomplish more than we imagine. Our ideals and our faith compel us to act. Tom Hamel, Grace Episcopal Church, Medford. After a year of intense planning and prayer, ECM has broadened its mission to include protections for immigrants and action against racism. Their new organizational model is not just on paper. It was clear through the presence of young people from Grace Chapel Brockton, and the congregational support offered (visits, training, and email contact, etcetera) that ECM is really ready to BE funders, mobilizers, and prophetic leaders. Though I didn’t know many people there, it became clear that this was an open, active community intent on making a difference. As the room brainstormed a new relationship between ECM’s Board and ECM members, I had a vision of the power that emerges from communication among people of faith and ECM’s call to effective action. I felt a rising in my spirit because our Justice Group was no longer just six people trying to sort out the many wrongs in the world to be righted, the many compassionate relationships calling for our attention. Instead we could be yoked with others, Episcopalians with other faith communities and ECM partners, all pulling together toward justice and mercy. It gives me great hope. As members of the philanthropic community, we wholeheartedly denounce the Trump Administration’s decision to put an end to the Deferred Action for Childhood Arrivals (DACA) program. Read our joint statement in the Boston Globe. This statement has been made in partnership with: The Hyams Foundation; The Boston Foundation; Fish Family Foundation; The Herman and Frieda L. Miller Foundation; New England Foundation for the Arts; Schott Foundation for Public Education; The Cambridge Community Foundation; The Lenny Zakim Fund; The Paul and Edith Babson Foundation; Boston Ethical Community; Community Foundation of Southeastern Massachusetts; Eastern Bank Charitable Foundation; Greater Worcester Community Foundation; Haymarket People’s Fund; The Susan A. and Donald P. Babson Charitable Foundation; The Theodore Edson Parker Foundation; and TSNE MissionWorks. To join us in making a statement, sign MCAN's Solidarity Pledge. For more updates, sign up for our E-Newsletter. People of Faith and Values organize a Solidarity Network, including “Sanctuary Congregations” and call on the Governor to do his part. WHEN: Tuesday, January 31, 2017, 10:00 a.m.
BOSTON - Tuesday, January 31, 2017 – Massachusetts Communities Action Network, Episcopal City Mission, JCRC, The Massachusetts Moral Monday Revival Network, and UU Mass Action (with other allies) will gather Tuesday to host a press conference at 10:00 a.m. at Cathedral Church of St Paul at 138 Tremont Street to discuss the ongoing Executive Orders issued by President Trump that impact the immigrant community, Muslim community, and the community of color. This includes what we are doing by organizing “Sanctuary Churches” and “Sanctuary Synagogues” to protect our residents. "We are clear that we answer to a higher law," said Rev. Edwin Johnson, of St. Mary’s Church in Dorchester. "We will leverage our sacred spaces. We will unite as a state. The community has shown it’s ready for this." We thank Boston's Mayor Walsh, Somerville Mayor Joseph Curatone, Lawrence Mayor Daniel Rivera, Chelsea City Manager Tom Ambersino and the other Massachusetts' Sanctuary Cities mayor for standing up on this in the face of President Trump's attempt to cut federal funding to these cities. We call out Governor Baker to take steps to prevent federal Immigrations and Customs Enforcement (ICE) from deporting undocumented immigrant from our communities. We are also asking support for the recently filed state legislation for a Massachusetts Safe Communities Act, It would give no support for a Muslim Registry, Ensure due process rights to people detained in state and local facilities for civil immigration violations, Ensure police do not participate in immigrations enforcement activities, and prevent deputizing local officers to help ICE like Sheriff Hodgson and Sheriff McDonald are doing. On December 15, 2016 ECM presented $345,000 in grants to 19 organizations and 10 parishes at the 15th Annual Grantee Reception. ECM has been working diligently to build relationships between all of our grantees who are working for justice in our world. This was the 2nd time ECM brought together both Parish Partnership and Burgess Urban Fund grantees to the annual award luncheon. Wider Community Partnership grants are awarded in the spring and were not in attendance. The Burgess Urban Fund was established in 1975 to support grassroots organizations in the Commonwealth working to engage communities to lead, organize and reach those affected by social injustice. The Fund recognizes that community organizing is an important process that develops power and capacity in solidarity with those in need. ECM’s Parish-based grant program was established in 2012 to foster the participation of ministries in its roles as a more active agent of reconciliation and hope in a world that so desperately needs more of Christ’s body in action. For more on these organizations, click here. For more on these congregations, click here. On Saturday December 3, nearly 300 people--including many Episcopalians from St. Stephen's Boston and other partners of Episcopal City Mission--gathered near Downtown Crossing to show their support for immigrants and immigrant rights. The #SalsaShutDown action was organized by Cosecha, a movement fighting for permanent protection, dignity, and respect for the 11 million undocumented immigrants in the United States. The SalsaShutDown action was a kickoff of the MigrantBoycott effort which will demonstrate the economic power of immigrants, both as workers and consumers in the United States. But mostly today was about the joy of dancing and bringing some of that energy to the holiday shopping scene. The day began in Sproat Hall at the Episcopal Diocese of Massachusetts with a reflection led by the Rev. Marisa Egerstrom, a member of ECM's Executive Committee. She showed the early-arriving Episcopalians how political action is also spiritual action. Together, we linked the efforts of Cosecha with the story of Advent and the ways in which Mary and Joseph were also migrants in their homeland, facing oppression under the powers of the Roman Empire. Then, we all received salsa dancing lessons and practiced our steps before exiting in small groups to gather at local stores to show off our newly developed dance skills. All of this was to bring attention to immigrant rights and protection, especially as we face uncertainty of how federal policies may change under a new administration. For the Episcopalians who were part of the action, it felt like we were taking well-organized steps (to a salsa beat) toward building the Kingdom of God. 1) Go to Standing Rock – Some of the tribal leaders of Standing Rock have asked for clergy and lay leaders to come to Standing Rock, especially in the winter months, to keep a strong presence lest the camp be dismantled as a way to repress resistance to the pipeline. PICO partners have offered a place in their camp so that you can get linked into service and action with folks who have been on the ground for months. 3) Action at Army Corps of Engineers - for more information as to why the Army Corps and for when the action is occurring, click here. The Red Warrior Camp was established in partnership with the Sacred Stone Camp to help guide the nonviolent direct action resistance to the Dakota Access Pipeline. You can donate to the Red Warrior Camp or donate to the Red Warrior Camp legal fund. 6) Sign this petition asking President Obama to stop the building of the pipeline. 7) Join us on Wednesday, December 7th at Grace Church Medford to hear our stories more fully, engage in conversation and to participate in prayerfully discerning how to continue deepening our support. Dinner begins at 6pm and the program will begin at 6:45. Episcopal City Mission (ECM), a faith-based organization based in Boston, is seeking candidates for a new position of Managing Director. The Managing Director will report to the Executive Director and be responsible for ECM’s business and administrative operations. The Managing Director will be a key member of the senior management team and work closely with the Executive Director and Executive Committee to shape ECM’s programmatic response to social, racial and economic injustice throughout Massachusetts, working in partnership with congregations and community organizations. The full job description is posted here. November 10th, 7:00pm Beloved Community Strategy Meeting will explore how we might use both traditional organizing and creative non-violent direct action to be a prophetic voice for criminal justice reform and racial healing. St. Stephen’s, 74 S. Common St. in Lynn. Click here to RSVP and click here for a flyer to help spread the word! Monday, November 21, Inter-racial Potluck Dinner, St. Stephen’s, 74 S. Common, Lynn. RSVP here. November 29 - December 1st - ECCO Racial Justice Retreat, Tuesday, 11/29, 6pm, Wednesday, 11/30, 10-7pm, Thursday, 12/1, 10-3pm. At St Andrew’s Church, 135 Lafayette St. Marblehead. RSVP here. $100/person, or $50 for low income people, with scholarships available for those who need more assistance. November 29, 7:30 pm - Cooperative Metropolitan Ministries & First Church in Cambridge Present: A Very Special Evening with James Carroll - The Politics of Fear: Where to Now? Tuesday, December 13, 10am - Jobs Not Jails Rally on Criminal Justice Reform, location details to follow. ECM, together with our partners that comprise the Ecumenical Advocacy Coalition (EAC), has compiled a guide for the questions on the Massachusetts ballot on November 8th. We hope this guide will support deep reflection and discernment on how to engage our faith on these important issues. The Executive Committee (Board) of Episcopal City Mission today announced the appointment of the Reverend Arrington Chambliss as the next Executive Director of Episcopal City Mission. Her work with ECM begins on April 4, 2016. Chambliss currently serves as the Executive Director of Life Together, the young adult intern program in the Episcopal Diocese of Massachusetts, which she founded in 2008 and has developed into one of the premier Episcopal young adult internship programs. She has previously served as the Associate Rector of the Church of St. Andrew in Marblehead, and the Executive Director of No Ordinary Time and on the staff of several non-profit organizations. She was chosen by the board after a nationwide search assisted by the recruiting firm Ted Ford Webb Associates. Board members involved in the search process noted Chambliss’s energy and enthusiasm for ECM and its mission, as well as her instincts around strategy and understanding of the social and economic justice issues facing various communities. “She is going to be a great asset in guiding ECM to be a valuable change maker,” ECM Board Vice-Chair Erin Alarcon said. Episcopal City Mission, based in Boston, is a faith-based ministry founded in 1844 that promotes social and economic justice working through partnerships with congregations, community-based organizations and people within the Episcopal Diocese of Massachusetts, with special emphasis on the urban poor and oppressed. On December 15, 2015 ECM presented $300,000 in grants to 18 organizations and 6 parishes at the 4th Annual Grantee Reception. ECM has been working diligently to build relationships between all of our grantees who are working for justice in our world. This was the first time we were able to invite both our parish and Burgess Urban Fund grantees to our annual award luncheon. Our Wider Community Partnership grants are awarded in the spring so they were not in attendance. Celebrating its 40th anniversary, the Burgess Urban Fund was established in 1975 to support grassroots organizations in the Commonwealth working to engage communities to lead, organize and reach those affected by social injustice. The Fund recognizes that community organizing is an important process that develops power and capacity in solidarity with those in need. Our most recent grant program, Parish grants, was founded 4 years ago. They are based in the idea that Episcopal Churches can, indeed should, engage in the work of social and economic justice in their own communities. These grants are intended to promote parish engagement with the community that works to end the systems that lead to poverty in our communities. The following 18 organizations received these grants as part of the Burgess Urban Fund. Agencia ALPHA, Boston – Utilizing guiding values based on their Christian faith, an organization educating and serving the immigrant community of Boston by providing social programs and working to advocate for policy changes that will improve the quality of life of all immigrants. Asian American Resource Workshop, Jamaica Plain – A multigenerational, member-based nonprofit that works for social justice through programming in arts & culture, leadership development, and community activism. AARW works to serve Asian American’s of all ages within Greater Boston, but has a primary focus on low-income, English-speaking young adults. Brockton Interfaith Community, Brockton – Based in Brockton, MA organizing members of the community to achieve power for positive change, reaching across ethnic, racial and religious lines. Coalition for Social Justice, Fall River – Founded in 1994 CSJ works to bring together struggling, low-income working people to fight for economic justice in the main urban centers of Southeastern MA, Fall River, New Bedford and Brockton. Community Economic Development Center of Southeastern Massachusetts, Fall River – Working to create a more just local economy by building bridges to resources, networks and cooperative action for low incomes members of our community, specifically focused on improving the quality of and access to public transportation in Southeastern Massachusetts. Dominican Development Center, Jamaica Plain – Developing and empowering Dominican immigrants as well as immigrants representing all Latin American and Caribbean communities to achieve social justice by promoting and organizing around current laws, legal procedures, education, immigration reform, and human rights among others. Dorchester Bay Economic Development Corporation: Youth Force, Dorchester – Training local teens to be community leaders and community organizers, who in turn train other teens to be leaders and organizers. Essex County Community Organization, Lynn – Guided by the democratic principle that all people have the right to make decisions about important issues affecting them, ECCO works to fulfill this belief by using community organizing principles of leadership development and public action for social justice. ECCO organizes around a variety of issues affecting low and middle families and people of color, including economic security, criminal justice reform, and immigrant rights. Ex-Prisoners Organizing for Community Advancement, Worcester – Ex- prisoners working with allies, friends and families together to create resources and opportunities for those who have paid their debt to society. Lynn United for Change, Lynn – Working to make a difference in the lives of individuals while also helping to build the social movements that can win systemic change, also providing Lynn residents with the direct support, advice, and information needed in order to effectively address their own individual problems, while also becoming active participants in collective efforts to address the root causes of social inequities. Merrimack Valley Project, Lawrence – A regional power organization created by faith communities and labor groups back in 1989, working to address job loss, foreclosures and the decline of public services in their area, through leadership development and community organizing strategies. Student Immigrant Movement, Boston – A statewide immigrant youth-led organization identifying, recruiting and developing leaders who are invested in improving their communities through relational building, leadership development and electoral organizing. United Neighbors of Fitchburg, Fitchburg – An organization working to promote and maintain a spirit of community among Fitchburg’s diverse peoples and neighborhoods, by fostering equitable economic, educational, health, cultural social and recreational opportunities. WATCH, Waltham – A CDC working towards a more just community in the Waltham area by promoting affordable housing, providing leadership development and empowering residents through civic engagement. Women Encouraging Empowerment, Revere – Working to educate, protect and advance the rights of immigrants, refugees, and low-income women and their families through organizing, leadership development and service delivery. Worcester Interfaith, Worcester – A broad-based, city-wide coalition of 21 member organizations that work together to achieve concrete improvements in the area of youth, education & economic development for the city’s most vulnerable residents — specifically, low-income, minority & newcomer populations. Youth on Board, Boston – A project forging partnerships between youth and adults to create positive educational communities in which young people are valued, engaged and heard, working to bring the student voice and engagement to the forefront of the educational movement on a national level. The following 6 parishes received these grants as part of ECM’s Annual Parish grant program. Church of the Holy Spirit, Orleans – This grant is to help hire a Director of Evangelism to spread the Good News of the Food 4 Kids program, which served more than 30,000 meals in 2015. ECM will also be partnering with the Church of the Holy Spirit to tell the story of how this program not only serves the hungry, but also promotes justice on the Cape by calling to attention hidden poverty. Common Cathedral, Boston – Common Cathedral’s core mission is to honor the dignity of housed and unhoused people on the street. Through common art, City Reach, Bible Study, and its own board of directors common cathedral provides paid and unpaid leadership opportunities to its community. In 2015 they assumed leadership over the Boston Warm drop in shelters. Emmanuel Church in the City of Boston – received their grant last spring. Grace Chapel, Brockton – Alongside its ministry to children and youth, Grace Chapel has attracted a community of women, many of whom are single mothers, new immigrants and victims of trauma. This grant is for the establishment of a community of mutual support and empowerment that will include both healing and leadership development. Nuevo Amanecer, East Boston – A Lutheran church plant modeled after the Liberation Theology concept of base communities. The congregation is a partnership between a Lutheran pastor and an Episcopal priest. It seeks to create a community that will work for justice in East Boston and provide support to the activist community that is already established there. St. Stephen’s, Boston – St. Stephen’s Youth is focused on the wellbeing of the several neighborhoods in the South End and Lower Roxbury. This grant is to continue our support of the Building Leaders, Organizing Schools and Communities (BLOCs) program, which equips adults and teens to be civic leaders. Episcopal City Mission celebrates the election of The Right Rev. Michael Curry as the new Presiding Bishop of The Episcopal Church USA. ECM builds relationships and collective power across the Commonwealth of Massachusetts for racial and economic justice as the expression of God’s transforming love.